On our way to the Merry Cemetery – 10/7/2010 | Camperissimo! We woke up in Satu Mare quite early. Actually, Jay woke up a lot earlier than me and cycled* around the neighbourhood in search for a toilet. He found one just in time and had a nice coffee there, too. I missed all of this excitement because I was sound asleep and I only woke up when he returned to the van, quite relieved. *Jay: Actually I was running – not cycling – around the neighbourhood. Panic-stricken. With my legs firmly clenched together. There was no time for bikes. We took our bikes to the centre and had coffee in one of the streets. Our attempts in English or German to buy a cheesy pretzel didn’t work, so we switched back to Hungarian and ordered “sajtos szendvics” or something else with “sajt“. People in the bakery seemed really happy to hear us speak Hungarian. We left town shortly before 13.00, planning to drive to the “Merry Cemetery”, which we wanted to visit since we saw it on Michael Palin’s documentary, and then find a place to spend the night somewhere in the countryside. We were feeling really exhausted from all the partying and travelling and cycling and sightseeing so far, so we wanted to find a place where we could stay for two nights and just sunbathe and read and watch films. Something like the Polish lake where we slept a few nights ago would have been ideal. The road from Satu Mare took us across a hill and through a few weird villages. This was the moment where where we started to feel that Romania was very different than what we were used to. We noticed that the roads were extremely bad, for example, and instead of patching up the holes in the roads, in some places Romanians had filled them up with huge branches that served as a warning to other drivers. Most of the holes were just that, though – huge holes, big pieces of asphalt just missing. Later on, we would get use to this and develop the habit of whoever was driving shouting „Hole!“ to warn the passenger that the hole was unavoidable and that in half a second the van would jump and shake. But this was our first day on the Romanian road and, after some initial laughter, we were quite cautious and drove about 40 km/h. The second culture shock came when we drove through the most peculiar village – Negresti Oas. It was relatively big and had about hundred houses built right next to the main road. What was strange about it was that all of the houses were massive, expensive and built in the most incredible kitschy style – some of them looked like imitations of Antic temples, others were influenced by all of the Asian cultures rolled into one, some had a garden full of statues (for an example, click here). All of them were at least three stories tall and looked as if they had been built for huge families. Later on we would find out that these houses are owned by Romanians who worked abroad – in Italy, Spain or Great Britain – and saved a lot of money, then returned to build this sort of house in their home town (which originally would have just been a row of shacks). The other theory was that they were built by Gypsies who didn’t tax any of their earnings and that the houses were, in fact, completely empty on the inside. Of course, it was only our first day of travelling through Romanian villages so we were just completely shocked: so much so that we didn’t even think about photographing until we had already passed through the village. 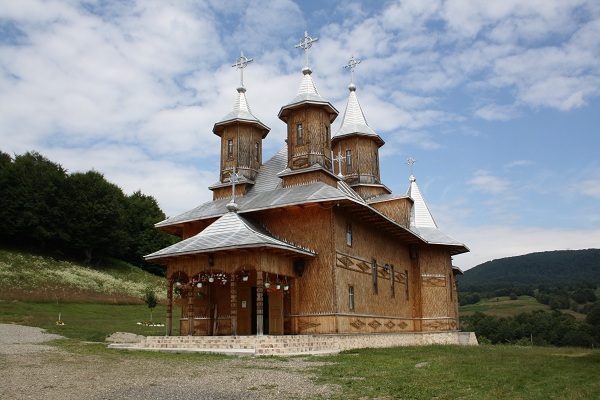 The Sfanta Treime monastery - built entirely from wood, apart from the shiny metal roof. Driving on, we spied a small wooden monastery on the top of nearby hill and drove up to it. We walked in to find a woman cleaning it. We were quite moved by stillness and quiet of this beautiful place in the middle of nowhere so we decided to leave a donation. The woman asked us to write down our names. It’s a strange thought, knowing that they are still there. Later that day stopped to wash the car and get diesel at a petrol station. Jay got extremely excited when he saw a car with British registration plates – we were in the middle of nowhere and it was a very strange coincidence to run into someone from England here! He shouted over to the guy filling the car “Are you from England, mate?“, but the guy just stared back at him, expressionless. Jay repeated the question louder, but got the same response. It was quite disappointing, but we concluded he must just be retarded. Later we would see a lot more of cars with foreign registration plates, mostly Italian, Spanish and British, but we stopped getting excited after finding out that Romanians working abroad simply buy and register their cars there to avoid Romanian road tax. For us it was, of course, the first time we had seen a foreign car in Romania, so we were just utterly confused. When we finally got to the Merry Cemetery in Săpânţa, it was obvious that lots of people have heard of it because there were a few tourist buses parked in front of it and it was full of people. Still, it was a very special place, with colorful paintings on both sides of the gravestones (or, more precisely, wooden crosses made from oak) – one depicting how the deceased person had lived their life, the other one showing how they had died. 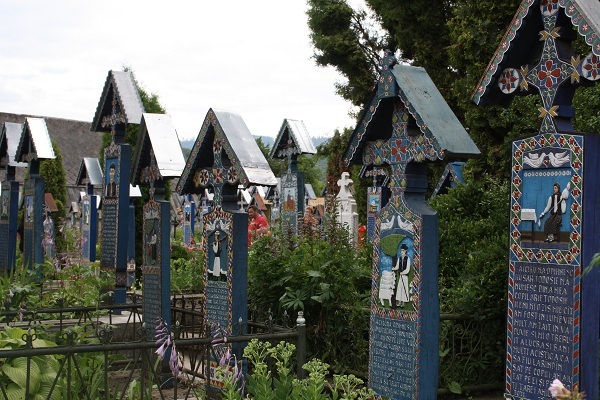 The "merry cemetary" in Sapanta has over 800 colourfully painted wooden folk-art gravestones, each of which depict the life story and manner of death of the person buried below. After leaving the cemetery our plan was to a) get something to eat and b) find a wonderful place to chill and sleep. We solved a) by driving to Sighetu Marmatiei and parking in a random street. I consulted our Lonely Planet to find a good restaurant (we didn’t do that often, but we were very tired and I wanted to eat something nice) and I couldn’t believe our luck when I realised that we had parked just 50 meters from the restaurant recommended as the best in town! 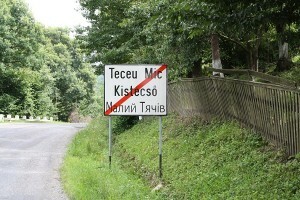 This entry was posted in Camper Trip July 2010 and tagged 2010, diary, gypsies, Merry Cemetery, monastery, Romania. Bookmark the permalink.